The CATESOL Journal is the official journal of CATESOL. It is a refereed academic journal published twice a year. The CATESOL Journal is listed in Linguistics and Language Behavior Abstracts (LLBA), and the full text is available through the EBSCO’s Education Source database. Articles in The CATESOL Journal focus on theory, research, pedagogy, and educational policy related to the teaching of English to speakers of other languages, including US-born bilinguals, Generation 1.5 students, immigrants, and international students. Articles may focus on any educational level, from kindergarten to university, as well as on adult school and workplace literacy settings. Feature articles (25-30 double-spaced pages including references and appendices): These articles focus on theory, research, pedagogy, and/or educational policy. Feature articles should show evidence of rigorous scholarship, make an original contribution to the field of education, contain ample references, and provide readers with insights that they can generalize to their own educational settings. Research-based articles should be driven by pedagogical problems and research questions that address those problems. We welcome both qualitative and quantitative research; in both cases we ask authors to keep the literature review and methods sections succinct and instead emphasize the findings and the applications of those findings to pedagogical issues. Articles that contain statistical analysis must be written in such a way that a general audience of educators (not just statisticians) can understand the methods and findings. Quantitative research articles should foreground findings rather than the tables of statistical data used to reach those findings. We recommend placing large statistical tables in the appendices. CATESOL Exchanges (up to 20 double-spaced pages including references and appendices): These articles are briefer, somewhat less formal, and less heavily referenced. Based on current or emergent trends in the field of TESOL, exchanges present (a) well-argued viewpoints regarding theory, research, pedagogy, and/or educational policy, (b) effective instructional techniques and classroom practices, (c) pilot studies, or (d) other discussions that are of interest to our readership. Exchanges should go beyond restating others’ ideas to presenting original interpretations, reinterpretations, insights, or applications. Reviews of books and other published materials (up to 4 pages): Review guidelines can be found at www.catesoljournal.org/review-guidelines. Proposals for theme sections: Those interested may also submit a proposal to serve as guest editor of a theme section. The proposal should include: (a) a cover letter explaining the rationale for the theme section; (b) a tentative list of four to six authors who have agreed to write articles for the theme section; and (c) titles and abstracts of the proposed articles. Graduate Student Perspectives: Articles for this theme section, published periodically, are written by graduate students and focus on various aspects of the graduate experience: professional development, the theory-to-practice connection, identity and socialization into the field, and so on. Articles are edited and specific themes for each Graduate Student Perspectives section are chosen in collaboration with the graduate student representative(s) on the CATESOL Board. When applicable, a specific call for submissions is listed on the CATESOL Journal webpage “Graduate Student Theme Section” well in advance of the manuscript deadline. Feature articles, exchanges, and reviews should be double-spaced in 12-point Times New Roman font with 1-inch margins on all sides. The title page should include the author’s name, affiliation, address, telephone numbers, email addresses, and a 50-word biographical statement. You may include acknowledgments on this page as well. The remaining pages should be numbered consecutively, with a 150-word abstract numbered as page 1. After the abstract, include a list of keywords describing your subject area; these keywords will serve as an index entry in a database. Some examples include workplace English, adult literacy, migrant education, classroom policy, multicultural education, critical thinking, learning strategies. The page number and title should be placed in the upper right-hand corner of each page. The style and bibliographic references should conform to the conventions specified in the Publication Manual of the American Psychological Association. To keep the review process anonymous, the authors must not be identifiable anywhere within the body of the article. Do not include institution names or acknowledgments. However, you should use author’s/s’ names in references or in-text citations. Please do not replace names with “Author(s),” as our reviewers may be familiar with your earlier work. 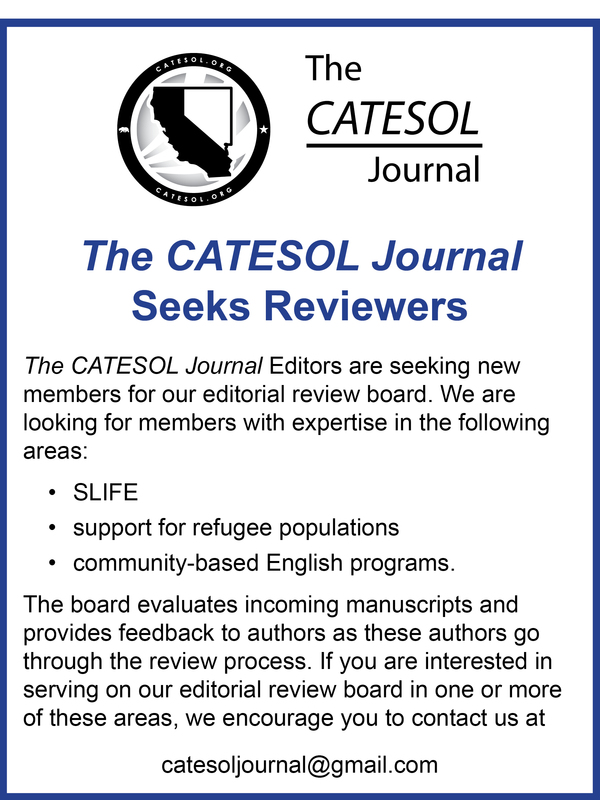 Articles, exchanges, and theme section proposals should be sent as an email attachment to catesoljournal@gmail.com. In the email message, please include the full name and current affiliation for each author, the complete article title, and the article abstract. Book reviews should be sent as an email attachment to catesolreviews@gmail.com. No multiple submissions. It is understood that manuscripts have not been previously published and are not currently under consideration for publication elsewhere. Receipt of manuscripts will be acknowledged within six weeks of submission. Manuscripts submitted to The CATESOL Journal typically undergo several rounds of substantive revision before they are ready for publication. Because The CATESOL Journal is a “mentoring journal,” contributors are provided with ample feedback to assist them in the revision process. When a manuscript has been formally accepted for publication, authors will be required to submit a complete electronic copy of the final version, including all figures, charts, tables, appendices, and illustrations. Figures, illustrations, and photos should be submitted as jpeg files. Charts and graphs should be submitted in the format, such as Excel, in which they were created. Authors are required to assign copyright to The CATESOL Journal before articles may be published. The CATESOL Journal reserves the right to make nonsubstantive editorial changes for style, clarity, and consistency. If you have any questions, please feel free to contact Mark Roberge or Margi Wald at any time.